Shrivers Salt Water Taffy at 9th st. and the Boardwalk in Ocean City, NJ. Hurricane Irene reports over the weekend pretty much skipped reporting on New Jersey but I did hear that it made landfall at Egg Harbor Inlet, just a few miles north of Ocean City. This summer I took this photo one evening on the boardwalk. 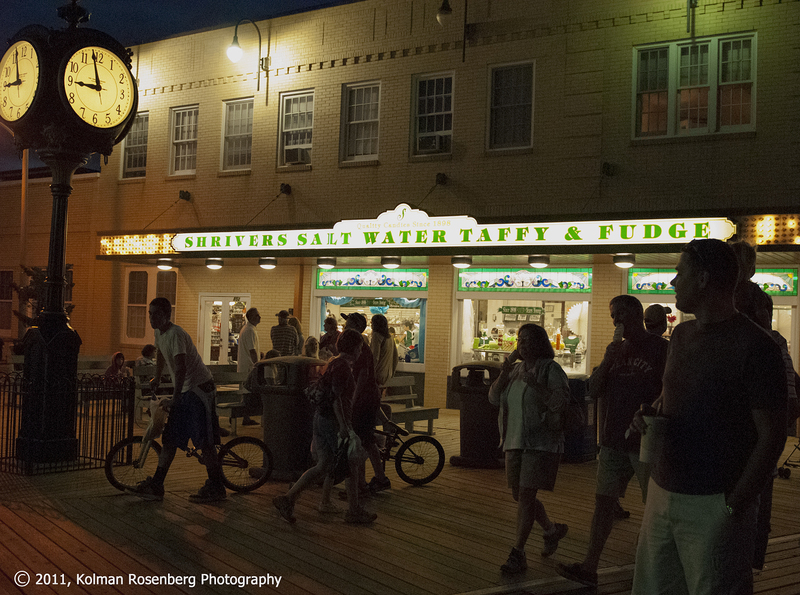 The Shrivers Salt Water Taffy store and production facility is the oldest business on the Boardwalk, founded in 1898. It’s website states that they are open, so fortunately any damage apparently wasn’t enough to shut them down! This photo was shot handheld at an ISO of 3200 and 1/400th of a second at f 2.8. It is a fairly “noisy” digital image, particularly viewed in a larger size, but I always encourage people to try shooting at high ISO’s. Depending on your camera, you may be surprised at the quality image you may get. I do recommend using a tripod at times like these, but you may get a decent image without one. This entry was posted in Uncategorized and tagged boardwalk, hurricane irene, iso, ocean city new jersey, photography, salt water taffy, shrivers. Bookmark the permalink. I’ve never shot anything at such a high ISO–until the first chance I get. Thanks for your continuing inspiration. The newer your camera, the better it will do at high ISO’s. Small compact cameras will still be challenged at ISO’s from 800 and higher due to their small sensor size, but DSLR’s are getting quite good in low light.